Food is a wonderful talking point, isn’t it? No matter what company I find myself in, as soon as I start talking about food, a proper conversation has started. You don’t even have to be face-to-face. Social media provides so many platforms for foodies to talk and share ideas about their favourite subject. One of the aspects I like so much about writing this food blog is the way it has helped revive connections with family members across the world, through a shared passion for food. Take my mum’s sister for instance, my Aunty Lorene. I haven’t seen her since I was 14 years old and had pretty much lost all contact with her. But through this blog and Facebook we have got to know each other again. And increasingly Lorene has taken on the role of one of my ‘culinary advisors’. In particular she was a great help last Chinese New Year, providing recipes and tips for all kind of authentic dishes she remembers from growing up in Malaysia. 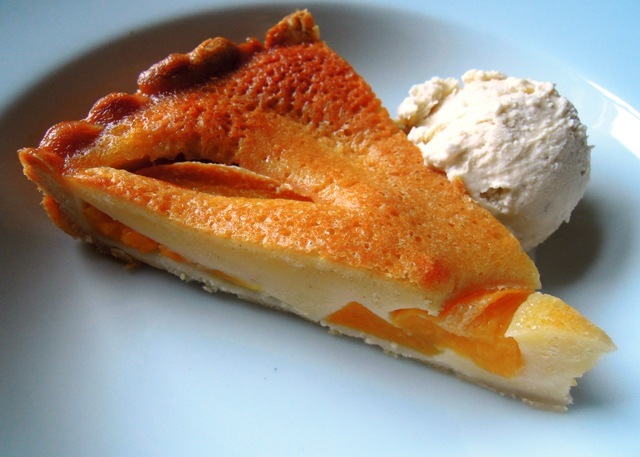 Lorene sent me her own recipe for peach pie recently, as she thought it would go down well with the children. Indeed it did, and the grown ups too. It’s a beautifully simple pie, using many store cupboard ingredients, and is delicious served with a generous scoop of vanilla ice cream. Grease a 20cm flan dish and line with the readymade shortcrust pastry, pressing firmly into the edges. Drain the peaches and arrange in the pastry case – you’ll probably end up with a few leftover. In a jug, beat the eggs and mix in the sugar, butter and vanilla. Then add the flour and combine well. Pour this mixture over the peaches. Bake in the oven for around 45 minutes until the filling is set and a lovely light golden brown colour. 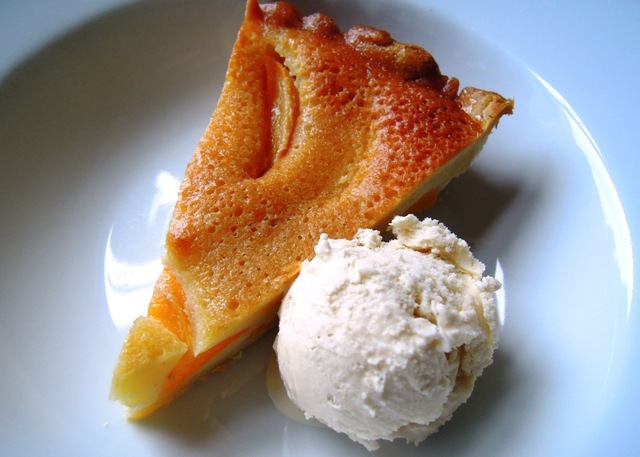 Allow to cool just a little before slicing and serve with ice cream or whipped cream. This pie is also good served cold the next day. Families can be a great source of food stories and recipes – everyone seems to remember the food of their childhood with fondness. 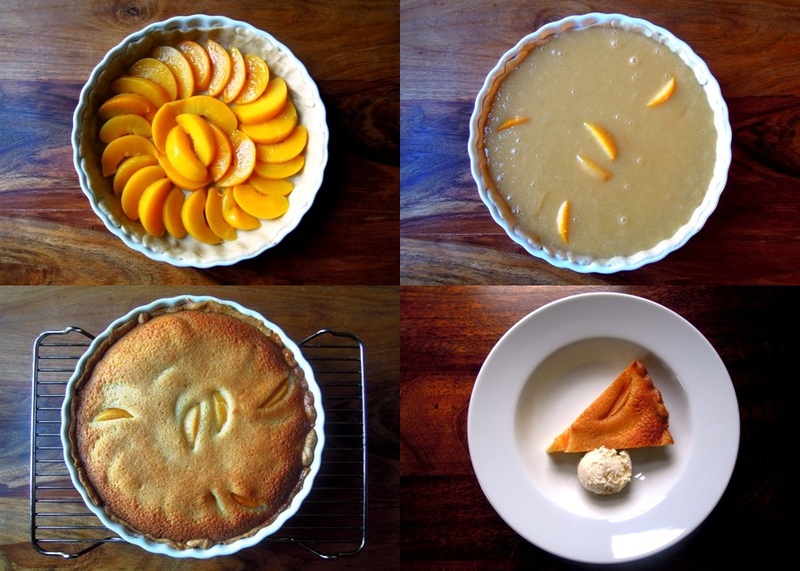 This peach pie sounds like a delicious recipe to ‘inherit’, thanks for sharing it! Thanks Nikki! It tastes every bit as it looks I promise! Wow! We have just enjoyed this as a Sunday lunch pudding- it was delicious and so easy. Thank you- have you considered writing a book? You write so well and your photographs are amazing. See you at school in the week. Your pie looks delicious! It’s so lovely to have family recipes, such treasure! Great pie! And even better for being a family recipe. I love tinned peaches and my husband even more so. I can’t remember the last time I made a peach pie so I think it’s time to change that! Thanks Sian. Tinned fruit isn’t normally my thing but I am a big fan of tinned peaches. I guess in the summer when fresh peaches are in season you could use them instead, but I actually think that would create quite a different tasting pie. This looks absolutely gorgeous. I do have a bit of a secret love of tinned fruit but we get such great fresh peaches here that I might try poaching some and making this pie.